Director Darren Aronofsky delivered audiences one of last year's most controversial films with mother!, which starred Jennifer Lawrence and Javier Bardem in an allegorical biblical tale that was marketed as a traditional thriller. 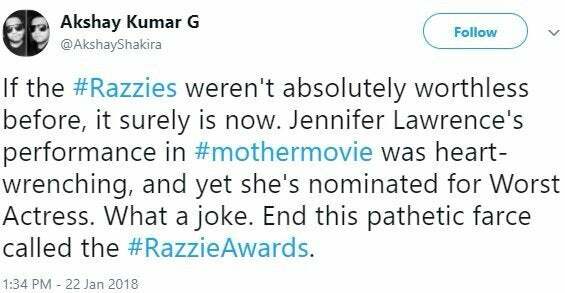 The Razzies, which distinguish the "worst" in film at a time when the Academy Awards celebrates films, announced that Lawrence earned a nomination for her performance in the movie, which the internet didn't take kindly to. Regardless of critical opinions of the film, which has 69% positive reviews and a 50% Audience Score on review aggregator site Rotten Tomatoes, the one element of the movie seemingly everyone agrees with is the strength of Lawrence's performance. 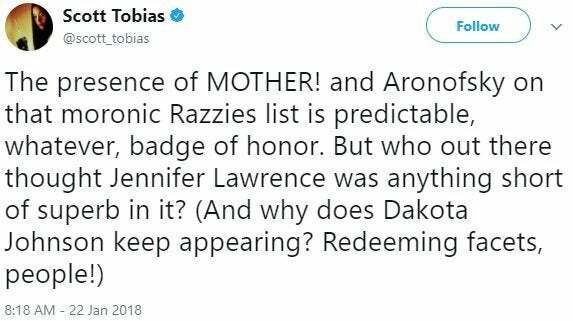 Lawrence wasn't the only one singled out for their involvement in mother!, with Bardem earning a Worst Supporting Actor nomination for his work on both the Aronofsky film and Pirates of the Caribbean: Dead Men Tell No Tales. 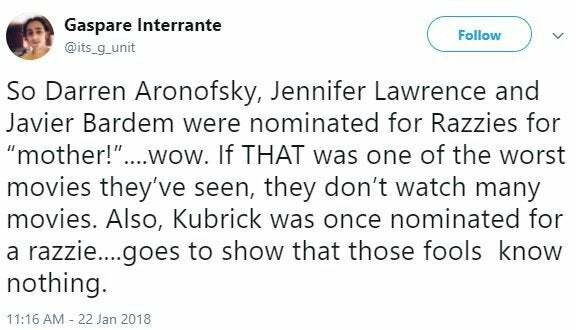 Aronofsky himself also earned a Worst Director nomination, yet the film itself didn't land the Worst Picture nomination. The film has been controversial ever since it debuted back in September, becoming one of less than 20 films to score an "F" CinemaScore, which determines a ranking based on audience reactions as they exit a film on opening weekend. Prior to the film's release, the only plot details audiences knew were "a couple's relationship will be tested when they encounter uninvited guests at their home." The film opened on more than 2,500 screens and, with a trailer that looked like a standard home invasion horror movie, delivered audiences something incredibly different from what they were expecting. Surreal and allegorical abstract films like mother! typically only open in limited runs and expand to more screens if they are a success, yet Paramount Pictures pulled out all the stops to shock audiences. The Razzies are held on Saturday, March 4, the day before the Academy Awards.